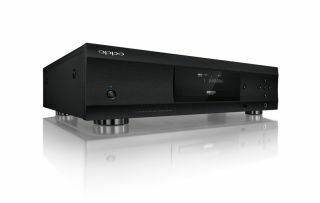 Oppo UDP-205 4K Blu-ray player aims to major on audio performance | What Hi-Fi? Oppo's latest 4K Blu-ray player packs more audio connections than its forebear, meaning you can hook it up to your hi-fi system. Oppo has a new 4K Blu-ray player, and if it's anything like its predecessor, we're in for a treat. Following on from the excellent UDP-203, the UDP-205 packs far more audio connections, meaning you can hook it up to your home stereo. There's a stereo analogue audio output with a dedicated DAC - and the choice of XLR balanced and RCA single-ended connections - plus a set of 7.1-channel analogue outputs. There's also an asynchronous USB DAC input that supports PCM and DSD files. Elsewhere, the HDMI output's clock precision has been improved, and the built-in headphone amplifier has been made more powerful. The UDP-205 also features new DACs - two ES9038PROs, which is the flagship in the ESS Sabre Pro range (the UDP-203 had an AK4458VN DAC made by AKM). There's a toroidal transformer onboard, which aims to make it more efficient, and the full metal construction hopes to ensure it's less prone to vibrations. Oppo also promises improved video processors. Of course, it also has all the skills of its predecessor - namely, it plays 4K Blu-rays, DVD-Audios, CDs, SACDs and more. And it outputs in 7.1 or 5.1 channels, or in plain old stereo. You can see the full list of specs here. It's due to go on sale in mid-May and will cost £1399. That's quite a step up from the £650 Oppo charges for the UDP-203, so let's hope it significantly ups the performance ante.